Goals from Steven Whittaker, Andrius Velicka and Mo Edu secured a crucial victory for Walter Smith’s men who had to dig deep on this tough trip to the capital. It was a nervy afternoon for the Light Blues and the Gers gaffer made one change to his starting eleven for the clash. Sasa Papac regained his left-back slot but there was no place in the squad for Barry Ferguson and Allan McGregor. Papac, who suffered a nasty ankle gash at St Mirren, represented only one change to the team that started against Motherwell last week with Christian Dailly moving to the bench. Stevie Smith kept his place on the left side of midfield and Velicka partnered Boyd in attack. The vocal away support were looking for their side to get off to an explosive start and they did just that with a sensational goal from Whittaker after only a minute of play. 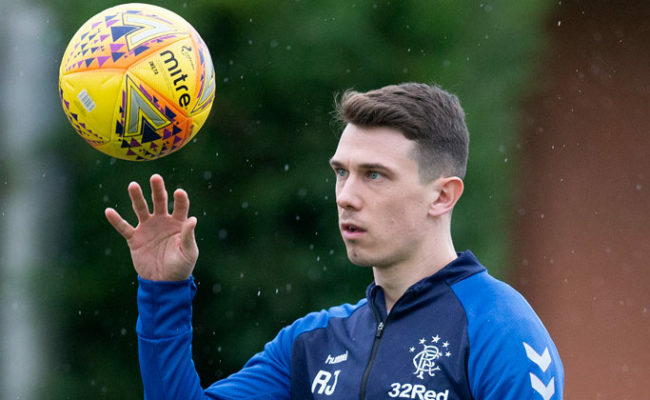 The ball was headed out to the former Easter Road defender who took one touch on his chest before sending a dipping volley off the underside of the cross bar in to the net. It was a terrific moment for Whittaker who has an uncanny knack of producing moments of magic. 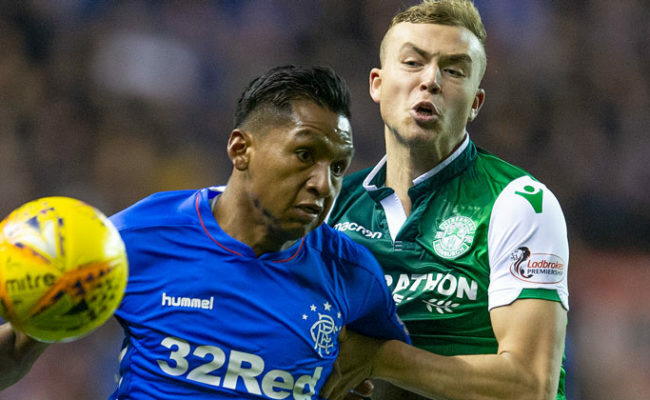 Rangers, however, failed to build on their early lead and Hibs built up momentum with Sol Bamba and Denes Rosa seeing plenty of the ball. On eight minutes Riordan, playing on the left wing, swung in a dangerous cross which Colin Nish headed wide under pressure from Bougherra. And Riordan himself then received the ball with his back to goal and his volley on the turn from 18 yards flashed past Neil Alexander’s goal. The game was being played at a break-neck speed in the opening twenty minutes but Rangers were guilty of missing a snip when Steven Smith delivered a dangerous back-post cross from a free-kick which Edu failed to nod home from close range. It was a great chance for the American who had found space and it proved to be a turning point in the first-half as Mixu Paatelainen’s men were back on level terms on 33 minutes. Stevenson was given time and space to pick his man with a cross from the left and Fletcher got between Weir and Bougherra to glance a powerful header in to the net. In terms of possession the Hibees deserved to be back on level terms but Walter Smith will have been unhappy at the marking from his defensive duo. With a pulsating 45 minutes coming to an end Paatelainen was forced to make his first substitution with Jonaton Johansson replacing the injured Colin Nish. And the former Ibrox star came close to giving his side the lead in the last move of the half when he latched on to long pass but his near post effort was smothered by Alexander at the second attempt. The second-half started at a similar tempo but there were clearly concerns on the Gers bench at way Hibs were dominating spells of the game. With only minutes of the second-half played Ally McCoist shouted both Christian Dailly and Kenny Miller to return to the dug-out from their warm-up area in front of the away end of the ground. A change looked imminent but this was thrown out of the window on 51 minutes when Velicka, who could have been one of those replaced, blasted home Rangers’ second goal. Davis found the on rushing Lithuanian with great pass and from a wide angle he fired home a great shot which beat Grzegorz Szamotulksi at his near post. It was a terrific moment for Velicka who enjoyed scoring against Hibs on more than one occasion during his time at city rivals Hearts. Hibs again showed the fighting spirit which has secured them a place in the top six before today’s fixture and they had a great chance to equalise on 69 minutes. John Rankin found Riordan with a delightful pass inside from the right wing. The club’s no. 01 took one touch before smashing a shot towards goal which stung the palms of Alexander. The next five minutes saw Rangers take total control of the game. On 69 minutes Miller replaced Velicka and almost immediately he set about terrorising the Hibees defence. Mendes played a delightful ball through to the striker who cut inside Rob Jones but his low, left foot curler was brilliantly tipped around the post. From the resulting corner Mendes floated in a back post cross which Davie Weir headed goalwards. Szamotulski palmed the ball nervously away allowing Bougherra to hook the ball back in to the six yard box. Miller tried his luck with a volley which was blocked but Mo Edu was there to blast the ball in to the roof of the net from close range. It was the American’s second goal in the space of two weeks and it came at a crucial stage of this hard fought encounter. On 83 minutes Hibs gave themselves a glimmer of hope when John Rankin smashed a stunning goal in to the top corner from 25 yards but this was to be a terrific away day for the Gers who remain within touching distance of Gordon Strachan’s men going in to the split.